America's oldest museum in continuous operation. See the largest collection of Pilgrim artifacts in the world! the "bones" of the Sparrow Hawk..the remains of a wooden ship wrecked off of Cape Cod in 1626. Join us! The Pilgrim Society is not a lineage organization. All it takes to belong is an interest in the early history of America and a desire to learn about it. Members receive the Newsletter, 10% discount in the shop, reduced price for special trips, invitations to special exhibits and Forefathers Day. The story of the visit in December 1650 of Father Gabriel Dreuillettes, S.J. to Boston and Plymouth from New France. 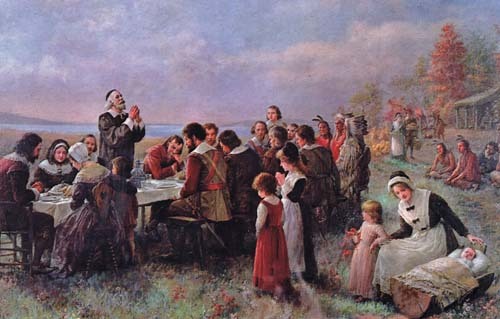 Father Dreuilletts made the trip on behalf of Governor D'Aillebousts and the Abenaki catechumens to propose an alliance between New France and New England against the Iroquois. Family Festival, Memorial Hall, 11- 3 p.m. The Family Festival is designed to provide an affordable, wholesome and fun filled afternoon for families. There will be tastings of special foods from area restaurants and educational and entertaining children's programming. This exhibition will feature shoes from as early as 1620 (the Winslow baby shoes), as well as the Penelope Winslow slipper. The exhibit will look at highfashion shoes (most likely to survive), utility shoes (including 17th century pattens and an early rubber gallosh, baby shoes, and working shoes (including men's shoes recovered from the excavation of the Jenney Pond area). "Put Your Best Foot Forward: Costume (and shoes) in Plymouth, 1620-1920." Four lectures on women's and men's costume and shoes will be held between April and June at the Plymouth Public Library. 175 Years of the Old Colony Memorial. Exhibit of the first edition (1822) of the Old Colony Memorial newspaper and related history. Tour Plymouth's most architecturally interesting Bed and Breakfast homes. The Pilgrims were employed by artists and writers as symbols, and works depicting them reflect the intellectual climate of the era in which the works were created. Images of the Pilgrims from the last 200 years can be seen in paintings, prints, costumes, film and other media, as well as tourist souvenirs. Thanksgiving has always centered on "home" and "family." Wartime Thanksgivings, with their enforced separations, have a special poignancy. This exhibit traces wartime Thanksgivings from the Civil War through Desert Storm. Directions: North Or South of Boston: Take Route 3 To Route 44 East To Junction of 44 and 3a (court Street), Right On Court Street (3a) To Museum, 75 Court Street. From West Take Route 44 and Follow Above Directions. by William Halsall, 1882. The original oil painting may be seen in Pilgrim Hall Museum, also known as America's Museum of Pilgrim Possessions. by Jennie Brownscombe. Painting is in Pilgrim Hall. 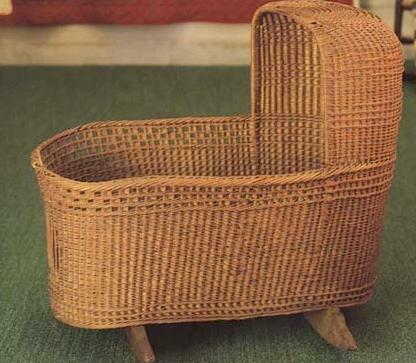 According to tradition, William and Susannah White brought this cradle on the Mayflower in anticipation of the birth of their child. 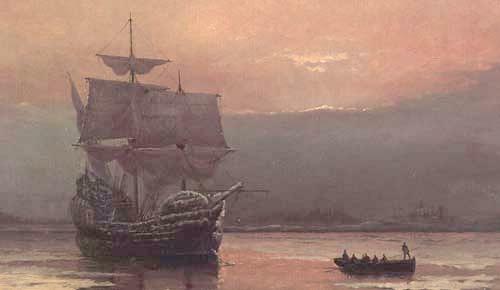 Their son, Peregrine White, was born aboard the Mayflower and thus was the first child born to the Pilgrims in the New World. The wicker cradle was probably made in Holland between 1610 and 1620.